On Saturday, The Spinoff published a fantastic and concerning piece by Simon Wilson on the City Rail Link. It comes following an interview with the CRL project director Chris Meale, whose answers to a few questions ought to have the new board of City Rail Link Limited, along with their stakeholders in Council and the Government asking some serious questions. The two issues are ones close to our hearts and that we’ve written on before, the level of future proofing and the Beresford Square entrance. It’s an important time for the CRL, the tendering process starts to get towards the pointy end of things. The deadline for the Expressions of Interest close on Wednesday, after which the eight remaining bidders will be whittled down to just two. Just two weeks ago I questioned if we were building the CRL with enough capacity for the future. As I pointed out, the CRL, once fully developed, will more than double the capacity of our rail network. But that doesn’t seem all that much when you consider the CRL team claim it’s being built with a 100-year design life. If we don’t design the CRL now with the ability to add longer trains in the future if they’re needed, we’ll never be able to go back and do it again. From my post the other week, it appears that it’s only the Karangahape Rd station that’s not able to have longer trains. Interestingly this line appears in Auckland Transport’s Code of Practice (ATCOP) for rail stations although obviously there’s some limitations to this. The station design must be able to be expanded by future additions without major re-planning or major functional/structural alteration. As the design of a remodelled or new station evolves, due care must be taken to not preclude further enhancements, changes in patronage or services. At present the design must meet the service levels specified to some future date. But that design should make provision for increases in services and an increase in the level of amenities provided. The design should reflect the module concept adopted by AT in terms of structures, but also make allowances for future systems such as ‘Integrated Ticketing’ automated gates. Who knows, perhaps they’re right and we won’t need longer platforms, in which case the space on the platform could be used for retailing or other amenities, but my guess is come to regret such a decision. 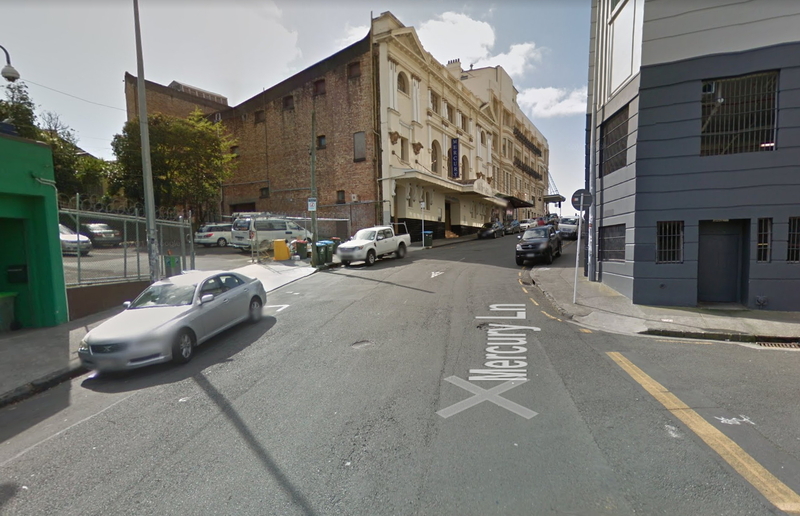 We’ve long be critical of the decision to only initially build the Mercury Lane entrance to the Karangahape Rd Station, leaving the more prominent and more popular Beresford Square entrance to be built at some other time, if it ever is. They’ve said in the past that this was mainly because this entrance is easier to build and allows for more new development around it. That last comment is astounding and that alone should have the board and stakeholders asking serious questions. The Mercury Lane entrance is located down a steep street away from K Rd that I imagine would be difficult for many sections of society who struggle with mobility. Here’s what it looks like today and I know many people who would struggle to make it up there. By comparison a Beresford Square entrance would be at the same level as K Rd making for an easy and level connection to the area. What’s more, it seems that once again this is a case where the CRL team have once again completely ignored AT’s own rules regarding station design. Once again here’s ATCOP and while I believe it’s primarily talking about within the station, given the K Rd station is about serving K Rd, access for passengers to K Rd should also be included. Further, given stations are also required to comply with national guidelines for access and mobility, my guess is that if the access to K Rd was included then it wouldn’t comply. Stations need to provide access for disabled persons to and within the precinct. 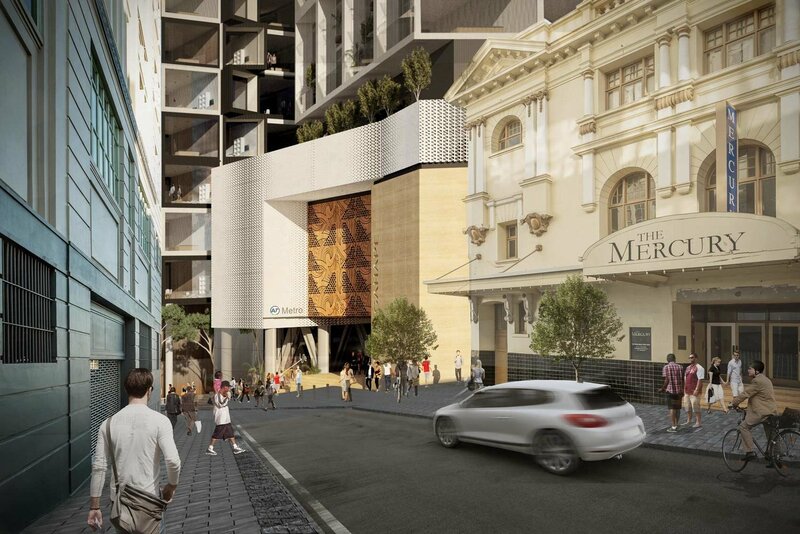 CRL team also talk up the Mercury Lane entrance as being good for connections to light rail, which would be about a 180m walk along Cross St, although at least in this case it’s a flat walk. But this ignores that a Beresford would allow for easier connections to the huge multitude of buses that travel through the area, including the inner link, most of the buses from the inner/northwest and in future even the NEX3. Then of course there’s the age-old issue of modelling. CRLL consistently say that they’ve designed the project to cope with the expected future demand. As I understand it, one issue is they’ve modelled demand based on the capacity of the trains we’ll have, not the total demand from the public. In other words, we have 6-car trains so the maximum possible demand is a bunch of 6-car trains full of people – of which only some will get off at K Rd. My guess is that over the 100-year design life of the CRL, we’ll see a lot more demand than the CRL can provide. My guess is a lot of the thinking with the CRL can be summed in this quote. If we’re going to spend up to $3.4 billion then we deserve better. This is concerning, and has Waterview Syndrome written all over it. A massive budget, changes to the project that are totally at odds with what was promised that aren’t being communicated and zero vision. His comment on the walk being “good for you” was so white male centric that I suspect he was being flippant. The same must surely go for his comments on platform length. I can only hope the line “…Who’s talking about longer trains?” was accompanied by a guffaw, a thigh slap and a “Gotcha!”. Otherwise, he sounds like the most dangerous sort of bureaucrat – industrious, reliable, efficient, unimaginative, incurious, blinkered and the bumbling creator of something monumentally stupid. As a white male I object to being included. Especially as a rather old plump male who has often visited CBD with grandchildren. Stupidity is not a uniquely white male attribute. I would be happy with the thesis that selfishness is more frequently male than female but any discrepancy is minor. For example deservedly there are many more males in prison but on the other side of the coin the numbers of males and females not in prison are similar. Mr. Atkinson I very much agree with you. I can only imagine the moderators response if Sanctuary had said the same regarding females and another race. It is also an odd comment since it seems that a large part of the audience here and those promoting good public transport are in fact white males. I’m sick of #notallmen. We’re not saying all men. White men in general are the most privileged, and this comment is typical of his ilk. Thankfully some people are aware of their privilege, but others aren’t. As someone who isn’t disabled, likely to push a baby carriage or struggle with a wheelchair, this planner is completely ignorant to the needs of his constituents. No ones calling white males stupid, we’re saying that they often aren’t aware of how fortunate they are and are unaware that others may not be so fortunate. You taking personal offense to this comment is part of the problem. Is racism now accepted on this blog? Moderators please take the necessary action to remove this post. Better to call it out and let it stand methinks? The guy’s race was irrelevant. You could say his comment was ableist, at a real stretch sexist, but to bring race into it shows where the commenters head space is. Here we go again. We nearly get it right, but manage to stuff it up in the end. Is there no end to our short sightedness? Quite. At a hearing on the CRL, I pleaded with the “experts” to please not do another short-sighted mistake like the harbour bridge. They understood what I was saying, but didn’t promise that they wouldn’t. I asked them to consider allowing provision for platforms to be 200m long (a normal length internationally). As I recall, silence. Looks like the CRL will have to become an underground stretch of inner city light rail, and we’ll have to build a proper commuter/metro rail line underneath it (like Market St in San Francisco, with the Muni above the BART), 10 years after the CRL opens … just like the harbour bridge. Why are Auckland/NZ transport planners so short-sighted? On the Mercury Lane “short walk” comment, would it be possible for AT to put a caveat on any future development above the station that says it must include a lift and/or escalator with access to K road? Then there’s no extra cost to ratepayers and we all get better access. Truly astounding. I’m a fairly fit guy and _I_ try to avoid walking up that incline. I know mobility impaired persons and there is no way they would ever be able to make it up that incline. Also, every time I see that render I want to scream at my screen – You can see from the streetview image that the incline is substantially steeper than shown and as for the apartments, do they really think that they can build a massive 8+ story apartment building on that spot? It overlooks the busiest section of motorway in the country. Many years ago, when I was just a young buck working my first real job, one of my managers gave me some sage advice after I failed to diagnose a customer issue – Drive it as the farmer would. Mr Meale needs to actually use the transport we have in peak hour and then try to walk up that incline in dress shoes, catch a connecting bus perhaps. He also needs to take a step away from the projections and look at the historical projections vs actual. Agreed, there are already a dozen apartment buildings right next to the motorway there. Actually, before I moved to Auckland I used to visit a friend in Copeland St – Was really nice walking to the footbridge over the Nth-Wstn motorway and watching the cars near sunset. Saw a crash almost every day, though. My comment about the proximity of the CMJ was angling towards the noise and how we generally don’t use double glazing in NZ. Having said that, the council does have rather strict noise limits for new builds (at least on Hobson St) so perhaps that will save the inhabitants. We were filming in Galatos Street on Saturday. The noise from the motorway is nowhere near as bad as most people would imagine. Well if AT own that land and have used it for construction, building a bunch of apartments there, integrated with the station, could help fund the CRL and address (in a small way) housing supply issues. Seems like a no brainer. Somebody seriously needs to take this guy aside and give him a good shake up! How can someone is such a position be so naive/blasé about future use? Absolutely any new platforms built anywhere in Auckland should be minimum 200m long and ideally 216m long to accommodate up to 9-car EMUs. I can’t believe he thinks there would never be a 9-car EMU set either! This is a 100 year asset! Reality of Aucklands rail network mean that it can never have the very high frequency of dedicated lines overseas so the only way to increase capacity is to have longer trains. A 9-car EMU would straight away provide a 33% increase in capacity. Upgrading the EMU’s to permanent units (removing the drivers boxes so only 2 remain) would further increase this capacity by around 10% so in total a permanent 9-car EMU would have around 44% more capacity than a standard 6-car EMU. As for Beresford Square – again the lack of foresight is astonishing. It most definitely will need a second entrance. Back to the platforms, I still think that Aotea is being built with too small a platform (width-wise) and will suffer from over-crowding. haha true! My head isn’t quite with it this morning Sailor Boy! So 50% capacity increase plus the 10% from permanent sets means a 60% capacity increase and for little extra running costs other than the maintenance on the extra cars. does one entrance meet health & safety requirements in the unlikely event of a fire or something more sinister, Or simply a maximum number of people allowed per entrance? Technically there will be five entrances, surely? I think there will still be emergency fire exits they just won’t be used normally (could be wrong on that but I think that is the first part of the Beresford Square entrace – a fire entrance… which then begs the question why not just spend a few more million and have it as a proper entrance!). Why not indeed. Way cheaper to do it now, than to try and do it later when the station is in use. Especially if access/egress to there is being done now anyway. It’s criminally insane. The Council need to act now (and, with the attitude exhibited, it looks like Meale must go, he seems to be an un-reformable character). A bigger mistake might be junctions on the level, like London’s Circle Line. London learned that mistake and later lines all have burrowing junctions (grade-separated). There is only one junction being built as part of CRL (Mt Eden) and it is grade separated, so not sure what your concern is. The old “Newton” (Eden Terrace)-Mt Eden section was going to be a flat junction. Fortunately common sense prevailed (although “Newton” was lost). Does anyone know whether a 9-car set would have a material impact on the headway between trains in the CRL? It would obviously reduce the gap by 72m but it this of any consequence? It shouldn’t make a difference except for the 72m as mentioned which would be what 2 seconds? That is the advantage of longer trains – they increase capacity massively without running into headway issues. It would be more than 2 seconds as that would be 36m/s, which is 130kmh! My guess would be 5-10 seconds, although I don’t know what average speeds to expect so hard to calculate this exactly. The question is would this have a material impact on trains two minutes apart, would they instead have to travel 2:10 apart, which is a 8% reduction in capacity if my maths is right and could completely bugger up consistent timetables. I agree though it would certainly be better than more short trains for boosting capacity. I guess it would depend on what settings they had. For example if the setting is based on the first carriage passing over then it wouldn’t matter whether it was a 3,6,9 car EMU. If it was based on the last car being clear then it would matter. There is another downside in that the longer the train the more likely one selfish person holds a door and delays the train since there are 50% more doors, but really not normally a problem. Surely it is less likely that someone holds a door if there is more capacity though? @Sailor Boy – It happens in Hong Kong on occasion, which defies belief since the trains are incredibly frequent (as often as ~2m, depending on line. Src: http://www.mtr.com.hk/en/customer/services/train_service_index.html). A 3 billion dollar project with one usable new station, Aotea. Good job. At least the trains will be able to go around quicker I guess. +1, and building one station too short so that instead of tripling network capacity, you only double it. The “not a difficult walk” comment infuriated me. Is there someone with greater authority/influence than me who would like to invite him on an ‘accessibility train ride’? Take a couple elderly people, one with a walking stick, a kid in a wheelchair, I can come with my two kids in a stroller, a few other people, and we’ll give him the weekly groceries to carry. We can go in and out of the some of the existing rail stations, try and make a connection or two with buses, etc. Maybe then he would start to understand a little something about access to transport. Good idea, Anthony. Maybe contact Living Streets Aotearoa and see if they’d be interested in doing a Public Transport accessibility audit of some sort, and invite Chris Meale to come in an open letter? Better still, ensure professional accessibility expertise is built into the project as it should have been from the start (at all levels including governance). This is how we are still funding and building non-usable long-term public infrastructure, buildings and spaces in NZ despite our supposed commitment otherwise. I am heartily sick of it. Interesting the directors backgrounds: Two women, 3 from UK work background (London Underground’s Jubilee Line extension etc). The response is extremely arrogant and I found the attitude irritating. Can we have a more responsible management that are accountable to the people they serve? Or they just serve the greedy directors who want to do the least with the highest profit? Thanks for outing this turkey. That interview is mind boggling in its smug, short-sighted, couldn’t care less attitude. This guy needs a (figurative) smack round the ears. It really is depressing that he is in charge of this project. I’d agree as written that it doesn’t bode well for the project overall, however I’d be careful in condemning the man before he gets a chance to respond. Journalists have been known to have biases (Hoskings?? ), so it is possible that there is misrepresentation, either willfully or accidentally. Yeah I’d like to see their PR in action following this. This article has set the CRLL public relations off to a terrible start! Maybe I missed it, but is it even possible to have longer platforms with the grades proposed? No, unless the track snakes from K Road to Mt Eden instead of taking a direct route. But that means more tunnelling and more cost. It is not level end to end, it does not slope towards the tracks. I’m a profound and prodigiously enthusiastic aficionado for concise brevity, parsimoniousness and efficiencies of verbal and written language for effectual communications. Exactly! Three stations on Wellington’s Johnsonville Line are at 1in40 and this works fine. Even better if they are located in a tunnel as with the CRL, where damp and slippery rail-conditions will not be a problem. There is even no technical reason to forbid a change-of-gradient along the length of the platform, such that only the front and rear carriages of a 9-car consist would halt on the steeper grade. Given the lengthy “vertical curves” required (i.e. the gradual transition to a different gradient), this would probably only mean a few centimetres of additional inclination over the length of a carriage. I worry that the opportunity for petty-mindedness to mess this project up is large. You’re all forgetting the elephant in the room being the cost blowout on this project. The CRL was originally promised for $1.8-2.5 billion yet it has already blown out to $3.4 billion. That’s a staggering figure when you take into account what isn’t being built into the project. Given it’s a $3.4 billion project now with hardly a sod turned in the soil how much will this project end up costing? My suspicion is that it wont be as low as $3.4 billion and the only way that figure will be met is by making concessions along the way. That’s why we aren’t seeing this project being future proofed and that’s why we’re seeing a watered down version of what the CRL could be. I think it will go the other way, once the construction tenders come in. Experienced international tunnellers might propose entirely different techniques or design to save time and money. They had the same with Waterview, it was reported up to four billion at one point and they managed to get it under half that figure. “…what isn’t being built into the project” – What about what _is_ built into the project, like EMU purchases. Take that away and the pricing isn’t that bad. What do you think the CRL should be then? TRM, there are certainly cheaper ways to improve our PT. Reallocating road space throughout the city from cars to bikes, pedestrians and buses would give way more bang for our buck. We could have a central city zone with 4-storey limit over a much larger area than our current cbd, perhaps reducing the intensity of demand right in the centre. We only really need the CRL because the necessary reallocation is too radical for road hogs to cope with. There are allegations that petty cost-cutting was responsible for the down-grading of the Grenfell Tower cladding material, from fire-proof to non fire-proof. All to save a mere £300,000. Are we seeing a similar reckless approach to the CRL specification? Save a tiny percentage of costs here and there, then leave it to others to sort out the downstream fiasco? . . .Oh, and respond with thick-headed answers to anyone questioning the wisdom of this approach? I hope that is not what is going on here, but the attitude uncovered by the journalism above is worrying. As if there is an element that would delight in sabotaging the long-term efficacy of this project. Dave B, you’re on fire! – that’s exactly the word that went through my head when reading the transcript: Sabotage. Was this guy Meale picked by Joyce to sabotage the CRL, so Joyce could say “I told you so”? I rarely see older people using the Otahuhu station. The long winding climbing walk to get to the platforms is too much. Britomart has escalators and access at ends of the platform. Mr Beale give us a good, user friendly service. good news finish it by 2021 and build another tunnel “the cross” . National will win election, NZ first will support them for 1 year before changing to support Labour Greens. NZ first wants more rail, not sure how this relates.. letting ppl know now. They will be ruined at the end of the CRL and scrapped, tunneling machines are usually built for one job. And also entirely unsuitable for the AWHC, unless you want a single lane tunnel. Extremely rare for them to be reused, they are often entombed in underground rail projects as it is too expensive to even bring them out. Most of the expense is in the cutting head which is designed specifically for a project. To design a cutting head for two different projects would likely cost more than two separate TBMs. The frame of them is only a fraction of their cost. TBMs more recently have been refurbished and reused multiple times. The CRL tunnels are actually quite short so the TBMs should have life left in them. The problem is access for removing them. If they start at the Eden end then they will likely have to remain buried in the city. If they managed to start in the city then they could easily be removed at the Eden end. or as David Dix suggests – could lower them below Aotea spin them 90deg (one left, one right) and get them to build CRL2!! (or do that but don’t build it just have them ready to go in a decade to build it). However in reality the TBM aren’t the main cost in tunnel construction. AKLDUDE – that may be technically true but it is similar to an axe with a new handle and a new head, it is basically the same as just getting a new TBM. Well, the TBMs for the Waterview were not only still going at the end of that job, they were carefully removed, sent back to their country of origin, refurbished, and readied for the next job. Main thing is you need to get the right machine for the job. Both the cutting head and, obviously, the correct diameter. And we didn’t have another 10m diameter tunnel on the horizon in NZ. If this is the level of foresight from the planners then it is no wonder that Auckland is in such a hole that it is today with public transport and amenities. Quite unbelievable attitude displayed by this Meale bloke. Is the plan still to have a level interchange at Mt Eden end? This also seems like a short sighted compromise. But there will be no full interchange at Mt Eden because the CRL rejoins the NAL after Mt Eden, so southbound trains can’t stop there after Karangahape. I wonder how much work it would take to allow that. Oh crap. I didn’t know they were going to remove the connect to the east. There was actually a scenario I support where that would be incredible useful. (Putting aside the usual skepticism whenever I suggest this.) If we went to the north shore via Devonport then initially a two line pattern converging through the CRL could be used to drive the CRL to its maximum use. Line one from north shore via Takapuna-Devonport merging into the CRL and coming out going east via Newmarket to the south. Interchange at Otahuhu. Then on to the airport. Line two from manukau via the CRL to the west. ~10 TPH on each line. Longer platforms. And you get the maximum use out of the CRL before building another CRL cross town to dupe the capacity. Longer platforms means steeper inclines in the sections between the stations. And adding half as much weight again on the trains can’t be good for their braking systems and useful lives. From everything I have seen of the CRL; it’s going to be inherently steep between the stations, close the level that many systems would require a rack-rail. Perhaps this could be the motivation for only 6-car lengths? Or we could just build the whole thing on an incline and have one station without level platforms to gain 50% more capacity. Our trains are individually braked. Whether we put three together or two, they operate the same way with negligibly different brake loadings. Would make a negligible difference to the gradient between platforms and there is nothing to say that either end of the platform can’t have a small slope on it. With a longer train, most of it will still be on the flat at the platform. It isn’t so much of an issue entering the platform area as the train is slowing down anyway so would reduce the need for braking, it is only the extra traction to get moving again on the uphill direction only so basically just Aotea Station as the K Rd Station departure isn’t so steep anymore with the removal of Newton Station. Has there been any reaction from Chris Meale or AT to this Post? I’c]d be interested on whether they will be able to make provision for the 9 car sets to be developed later at the underground stations without major shutdowns to what by then will be a very busy system. Would be good if one of our city councillors could ask that question of him.